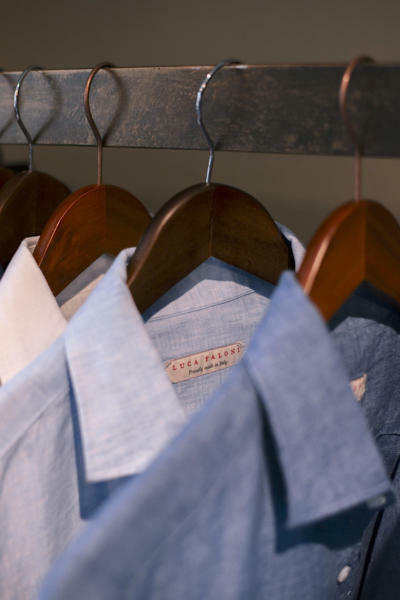 Given the heat at the moment in London, it shouldn’t be surprising that linen is the most attractive thing in the pop-up up shop, which has been going wonderfully so far. Edward Sexton’s Hollywood-top trousers (above) have been particularly popular, with readers taking the opportunity to try the style in person. Given their high rise but slightly lower waist, it’s not that easy to predict how the trousers will feel on the body; I’ve found some readers loving them, while others feel they’re a little too retro. Those that have liked them have bought, however, and a new shipment came in on Monday to replenish stock. Tobacco is the most popular colour so far. 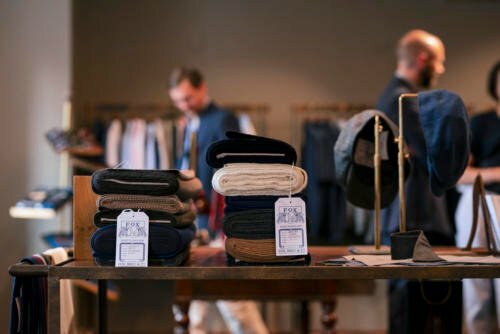 Over at Luca Faloni, it is equally unsurprising that the knitwear hasn’t been going fast, but the linen shirts have been popular. There are three styles available: the Portofino (one-piece collar), Versilia (collarless shirt) and Forte (collarless pop-over). They come in sugary, summery colours including pale blue, pink and indigo, but my favourite is the Forte in white - not to wear with a jacket, but probably on its own with shorts. Linen too at J. Girdwood. James added some navy-linen teba jackets to his collection this season, made with Justo Gimeno (above). For anyone that likes tebas, the details are great: deep navy, in a crisp linen, with matte-horn buttons. Perfect for the weather right now. Fox Brothers doesn’t do much linen, but it has added some ready-to-wear navy hopsack jackets, which are nice given we rarely have RTW tailoring on offer. 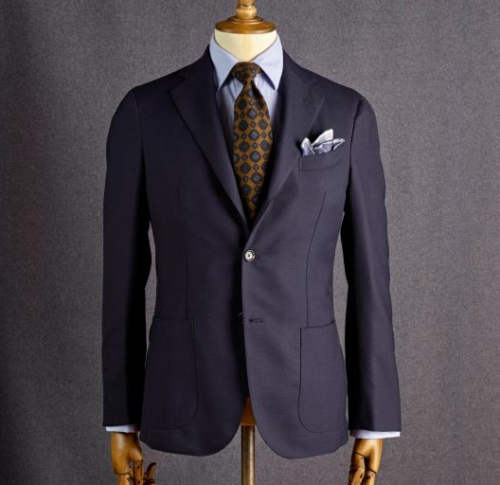 The jackets are made in Italy to a very high standard, with hand-attached collar, hand-sewn buttonholes and hand-finished hem. Fox also have the ecru twill cloth I re-wove with them last year - now in its third run. And a navy version that has just launched (ab0ve). 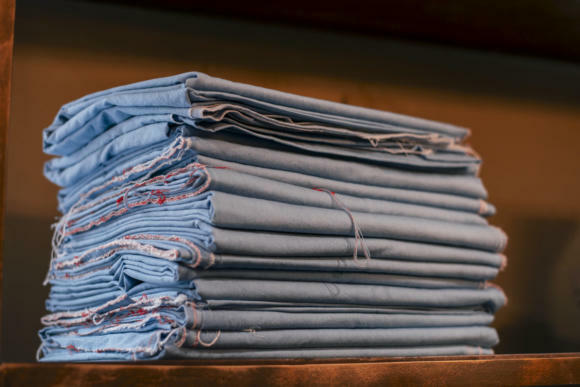 It’s great to see this cloth in person, as the double-twill texture isn’t easy to get across online. Both have proven popular so far, online and in the pop-up, even though at 16/17oz it’s not the best material for the weather. But I guess by the time any trousers have been made up in it, autumn will have rolled around. 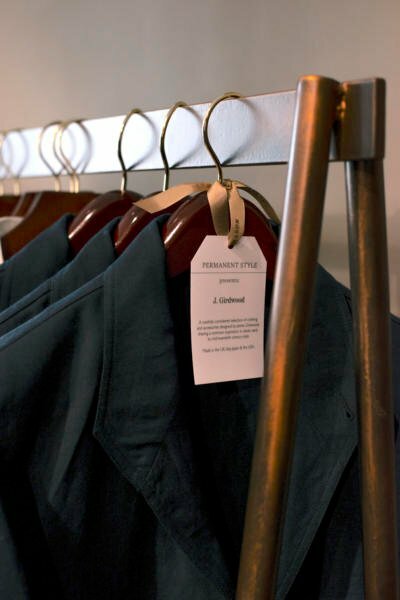 In my section, the Everyday Denim (above), Style Guide and Permanent Style shorts have been the best sellers - the latter a nice addition to the pop-up’s range, and we have some decent stock now. Shibumi left the pop-up yesterday, but my two favourite ties I saw were the seven-fold eggplant and the charcoal-green jacquard. Both deep, dark colours. 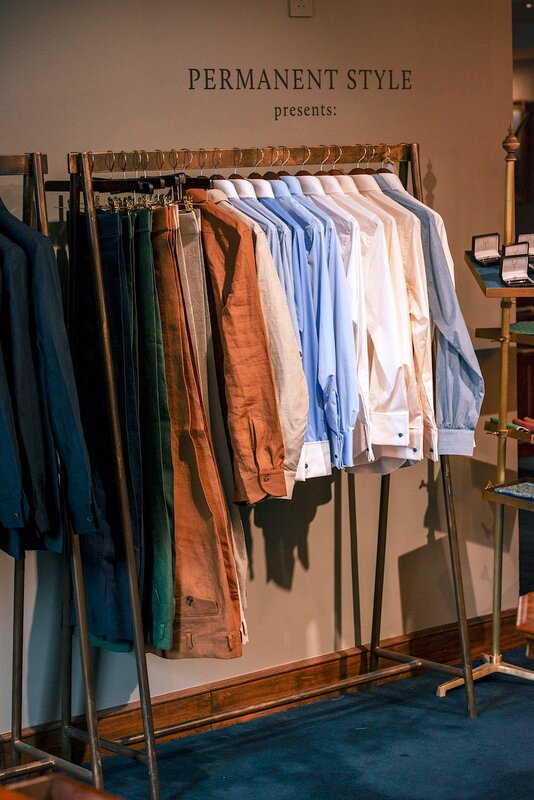 Drapers and Vitale Barberis Canonico appear today for the first time, replacing Shibumi. They will have ready-cut lengths of cloth to sell. 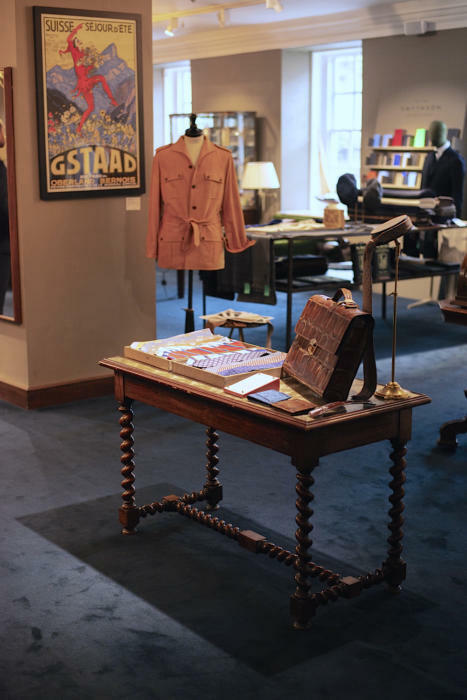 And trouser-maker Pommella and tailor Ciro Zizolfi will be here for a trunk show on Friday and Saturday. A busy end to the week. Thank you to all that have popped in so far - it’s been a real pleasure meeting you in person. You can follow the discussion on Popular at the pop-up: Hollywood tops, linen shirts, navy twill and navy tebas by entering your email address in the box below. You will then receive an email every time a new comment is added. These will also contain a link to a page where you can stop the alerts, and remove all of your related data from the site. 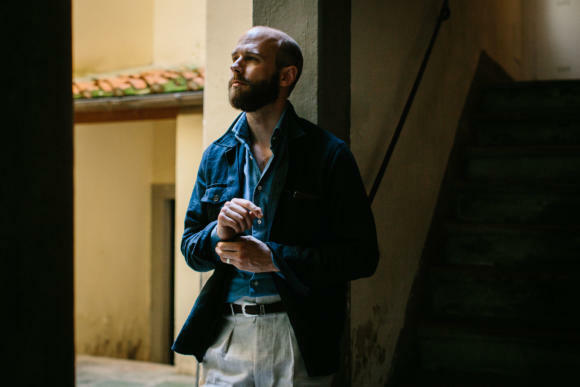 How much are the navy-linen teba jackets? and what is the smallest size current available? Sounds like a fun place to hang out in London these days! Do you know whether the Girdwood linen tebas will also be available in their online shop anytime soon? Couldn’t find them yet. Thanks. Curious what you think of the navy cavalry twill from Fox. I know you’ve expressed antipathy towards navy as a trouser colour, so it’s a little surprising to see this colour of cloth now “branded” with the Permanent Style label. 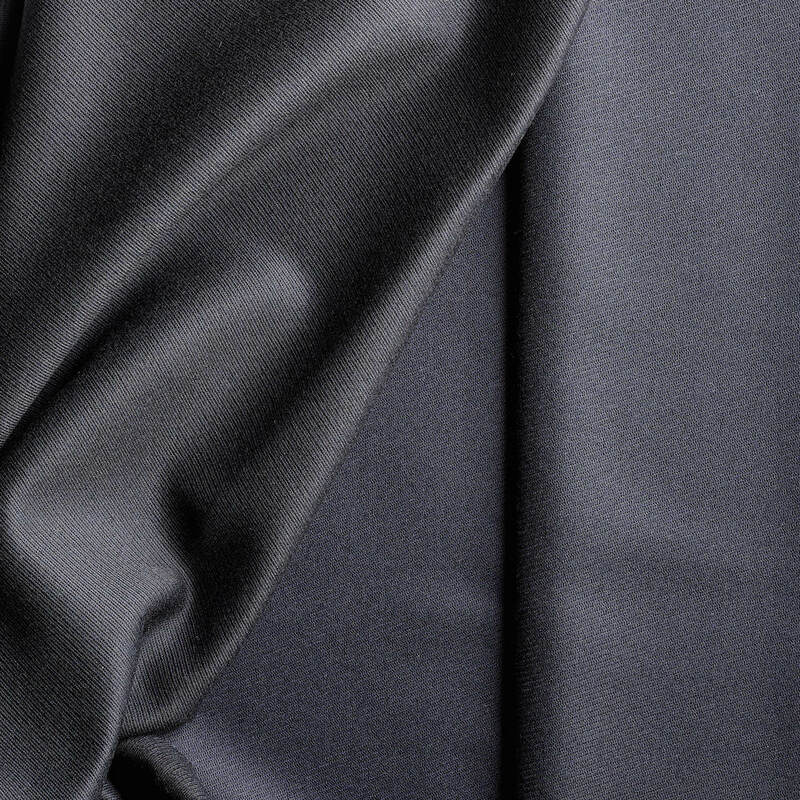 Do you feel differently about this material–that it works better despite being navy? Did you work with Fox to create this offering, or was it largely driven by Fox? I worked with them on this – I do like navy trousers a lot, just not generally with sports jackets. I have a pair of Fox serge trousers I featured here that I love in the same way. So with knitwear, with casual jackets like this A&S one, or just with a shirt. Thanks! Very helpful to better understanding your thinking (and I probably should have noticed those navy trousers the last few months). Im thinking about trying the Edward Sexton Holly Trousers, but my size of 195cm usually gives me quite a hard time. Are they being soled hemmed or unhemmed? Is there enough cloth to have them lengthend? Thanks, that would be kind. Hey Simon, I don’t want to appear pushy, but have you found out yet if the Edward Sexton Hollywood pants have excess cloth at the bottom? Otherwise, if you are short on time, I’ll happily just contact Sextons staff. Very kind Simon, thanks for the effort! I must say, for a 75 year old you are hiding your age pretty well! do you also offer some accessories ? I am looking for a new journal book…. Hope you’re fine and thank you for your work. I’d like to ask you an question which is not linked to the topic which I apologize for. What kind of fabric would you recommend for a first summer bespoke navy suit ? I love your coton DB from Musella but it might not be a first order. I’ve thought about Fox air fabric but its seems a bit crunchy, or also Minnis fresco 310g, and Fox “bright navy hopsack” 320g. Thank you for your help ! Since you mention Finmeresco, do you think the navy Finmeresco 12-13oz can work well as an odd jacket? Does it have enough texture for that purpose or it is meant for suits mostly. Do you have any Luca Faloni weekend bags on display at the pop-up? Is the Fox Bros./PS cloth only available from Fox as I don’t see it in the PS shop? Hi Simon, it was lovely to meet you and have a chat. The Teba is beautiful and I know that I’ll be getting a lot of wear out of it. Thanks for all the advice, and I hope things keep going great with the pop-up! Thanks Eitan, it was really lovely to meet you too. Good luck converting the rest of Tel Aviv to sartorial wear!